How do I compute whether my linear regression has a statistically significant difference from a known theoretical line? In an ideal world, the equation should be $y = x$. Clearly, my linear values are close to that ideal, but not exactly. My question is, how can I determine whether this result is statistically significant? Is the value of 0.997 significantly different from 1? Is -0.01 significantly different from 0? Or are they statistically the same and I can conclude that $y=x$ with some reasonable confidence level? What is a good statistical test I can use? Implementation in R: Suppose your data is in a data-frame called DATA with variables called y and x. The F-test can be performed manually with the following code. 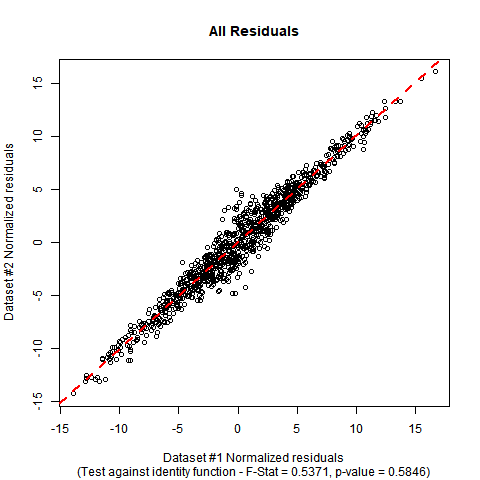 In the simulated mock data I have used, you can see that the estimated coefficients are close to the ones in the null hypothesis, and the p-value of the test shows no significant evidence to falsify the null hypothesis that the true regression function is the identity function. Here is a cool graphical method which I cribbed from Julian Faraway's excellent book "Linear Models With R (Second Edition)". 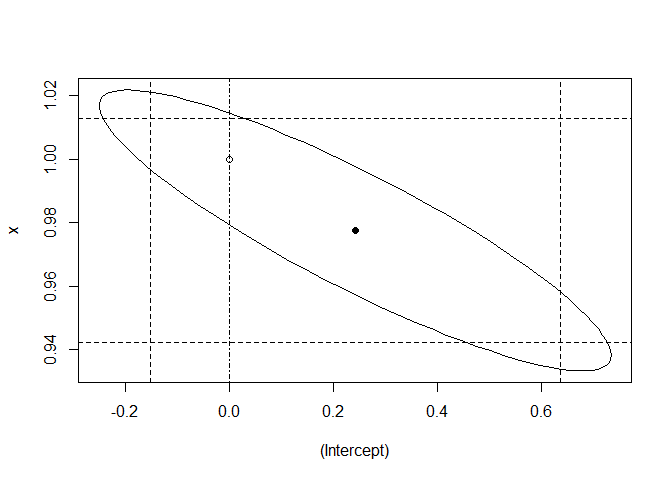 It's simultaneous 95% confidence intervals for the intercept and slope, plotted as an ellipse. 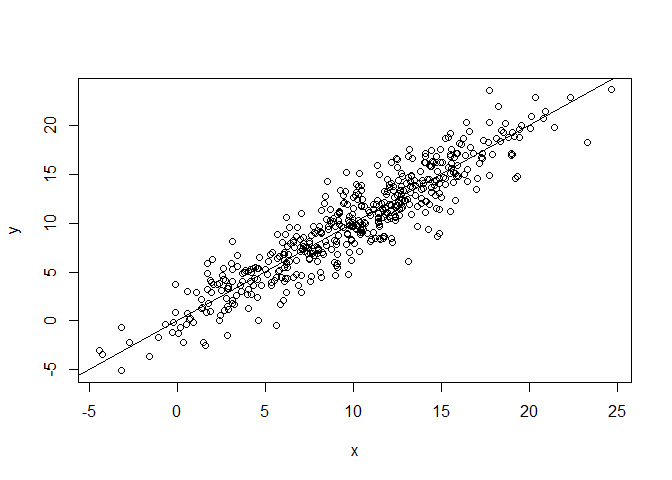 For illustration, I created 500 observations with a variable "x" having N(mean=10,sd=5) distribution and then a variable "y" whose distribution is N(mean=x,sd=2). That yields a correlation of a little over 0.9 which may not be quite as tight as your data. You can check the ellipse to see if the point (intercept=0,slope=1) fall within or outside that simultaneous confidence interval. You could compute the coefficients with n bootstrapped samples. This will likely result in normal distributed coefficient values (Central limit theorem). With that you could then construct a (e.g. 95%) confidence interval with t-values (n-1 degrees of freedom) around the mean. If your CI does not include 1 (0), it is statistically significant different, or more precise: You can reject the null hypothesis of an equal slope. You could perform a simple test of hypothesis, namely a t-test. For the intercept your null hypothesis is $\beta_0=0$ (note that this is the significance test), and for the slope you have that under H0 $\beta_1=1$. You should fit a linear regression and check the 95% confidence intervals for the two parameters. If the CI of the slope includes 1 and the CI of the offset includes 0 the two sided test is insignificant approx. on the (95%)^2 level -- as we use two separate tests the typ-I risk increases. and calc the 2 sigma intervals by yourself. Not the answer you're looking for? Browse other questions tagged regression hypothesis-testing statistical-significance or ask your own question. How to determine the significance of an interaction? How to determine if a (binary) variable has a statistically significant effect on a response variable? 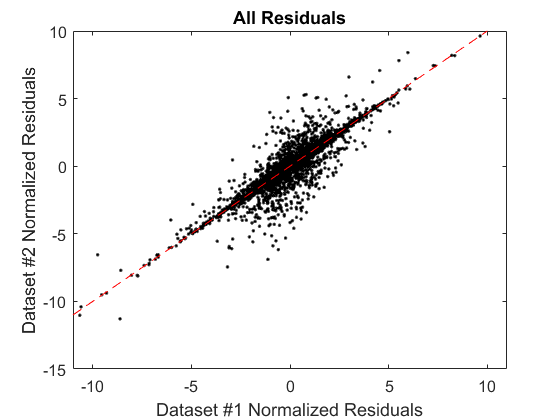 Finding statistical significant difference between multiple linear regressions (in R)? How can I use k-fold cross-validation to determine whether a linear regression model performs significantly better than chance?